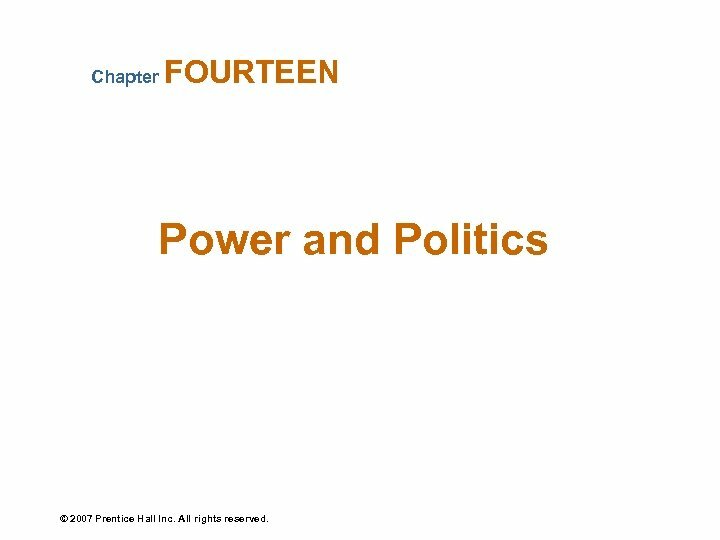 Chapter FOURTEEN Power and Politics © 2007 Prentice Hall Inc. All rights reserved. 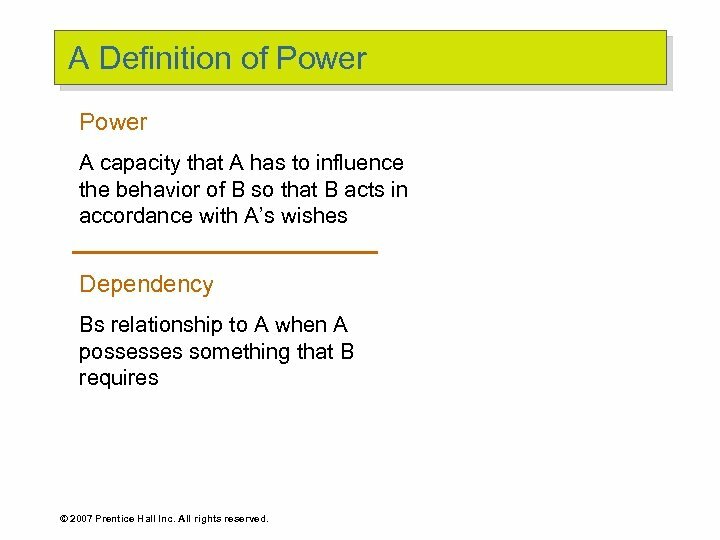 A Definition of Power A capacity that A has to influence the behavior of B so that B acts in accordance with A’s wishes Dependency Bs relationship to A when A possesses something that B requires © 2007 Prentice Hall Inc. All rights reserved. 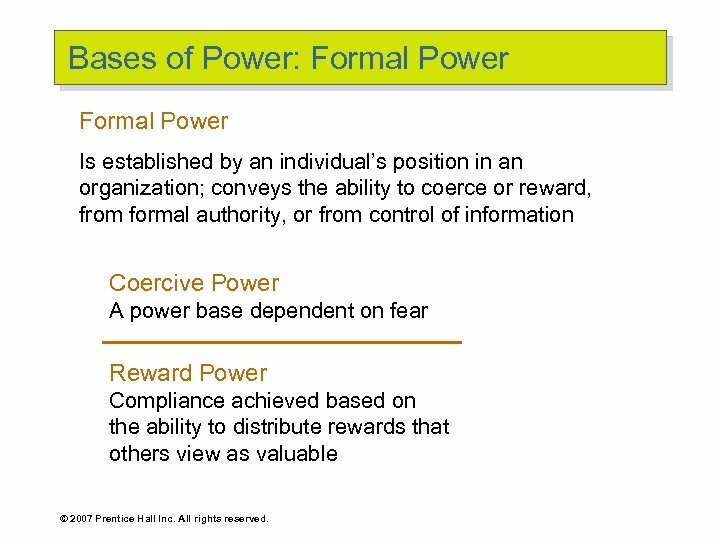 Bases of Power: Formal Power Is established by an individual’s position in an organization; conveys the ability to coerce or reward, from formal authority, or from control of information Coercive Power A power base dependent on fear Reward Power Compliance achieved based on the ability to distribute rewards that others view as valuable © 2007 Prentice Hall Inc. All rights reserved. 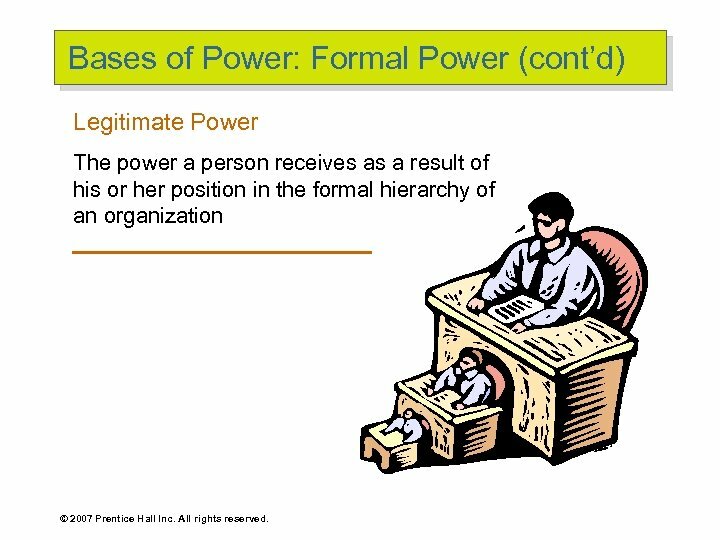 Bases of Power: Formal Power (cont’d) Legitimate Power The power a person receives as a result of his or her position in the formal hierarchy of an organization © 2007 Prentice Hall Inc. All rights reserved. 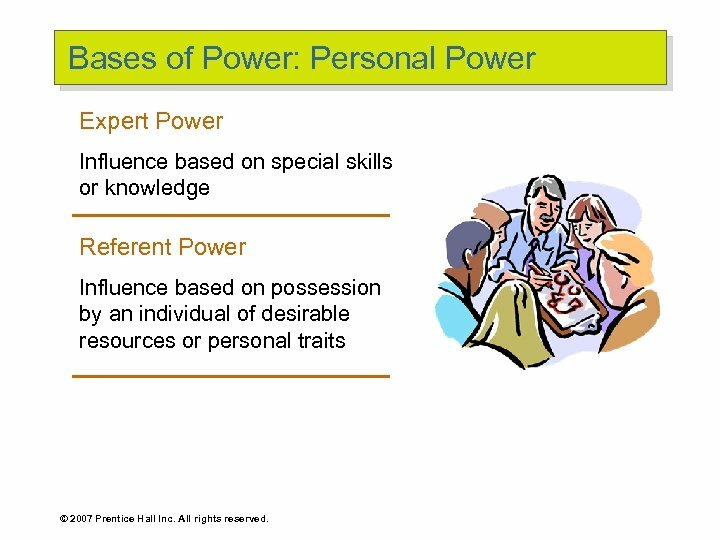 Bases of Power: Personal Power Expert Power Influence based on special skills or knowledge Referent Power Influence based on possession by an individual of desirable resources or personal traits © 2007 Prentice Hall Inc. All rights reserved. 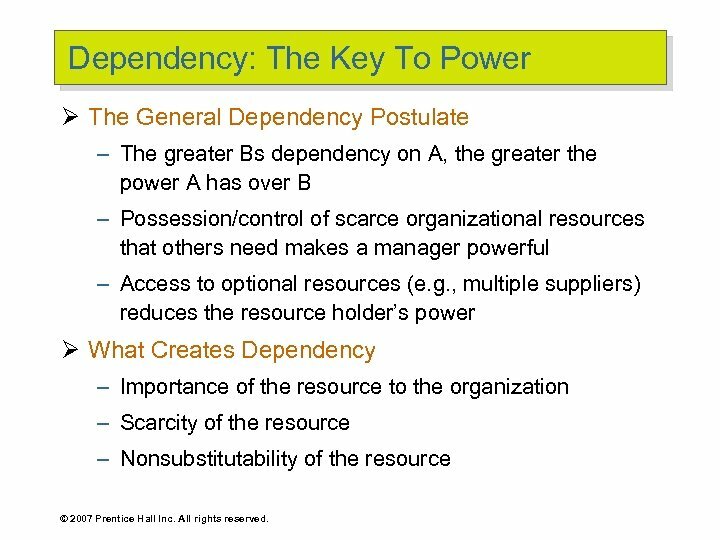 Dependency: The Key To Power Ø The General Dependency Postulate – The greater Bs dependency on A, the greater the power A has over B – Possession/control of scarce organizational resources that others need makes a manager powerful – Access to optional resources (e. g. , multiple suppliers) reduces the resource holder’s power Ø What Creates Dependency – Importance of the resource to the organization – Scarcity of the resource – Nonsubstitutability of the resource © 2007 Prentice Hall Inc. All rights reserved. 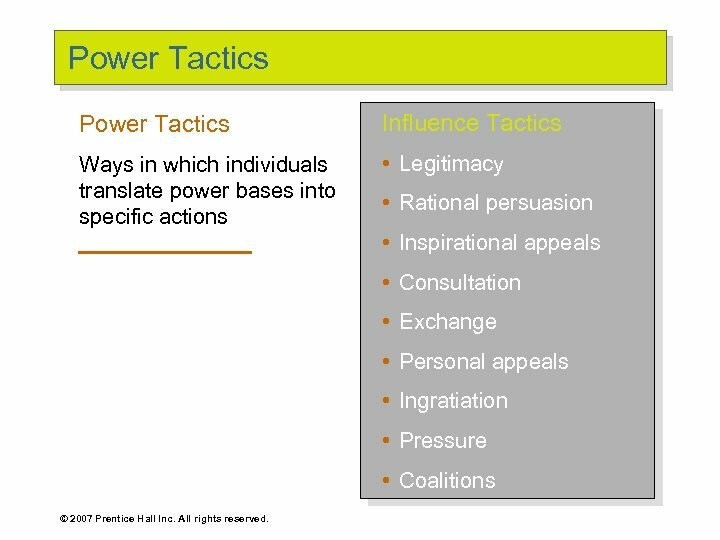 Power Tactics Influence Tactics Ways in which individuals translate power bases into specific actions • Legitimacy • Rational persuasion • Inspirational appeals • Consultation • Exchange • Personal appeals • Ingratiation • Pressure • Coalitions © 2007 Prentice Hall Inc. All rights reserved. 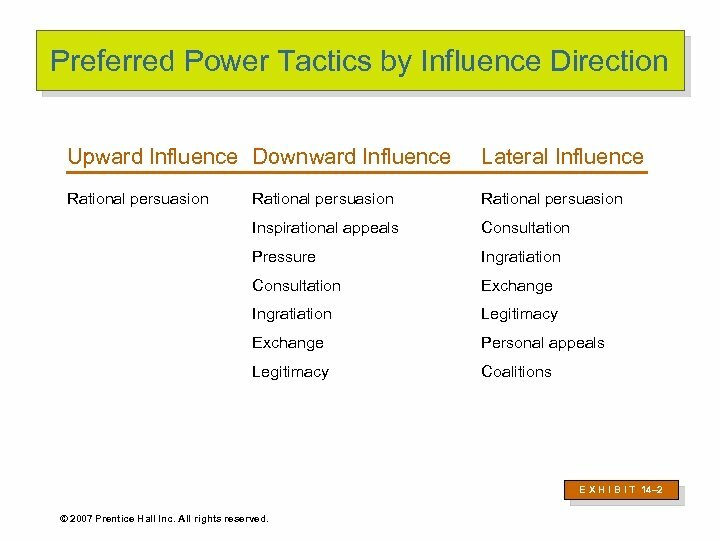 Preferred Power Tactics by Influence Direction Upward Influence Downward Influence Lateral Influence Rational persuasion Inspirational appeals Consultation Pressure Ingratiation Consultation Exchange Ingratiation Legitimacy Exchange Personal appeals Legitimacy Coalitions E X H I B I T 14– 2 © 2007 Prentice Hall Inc. All rights reserved. 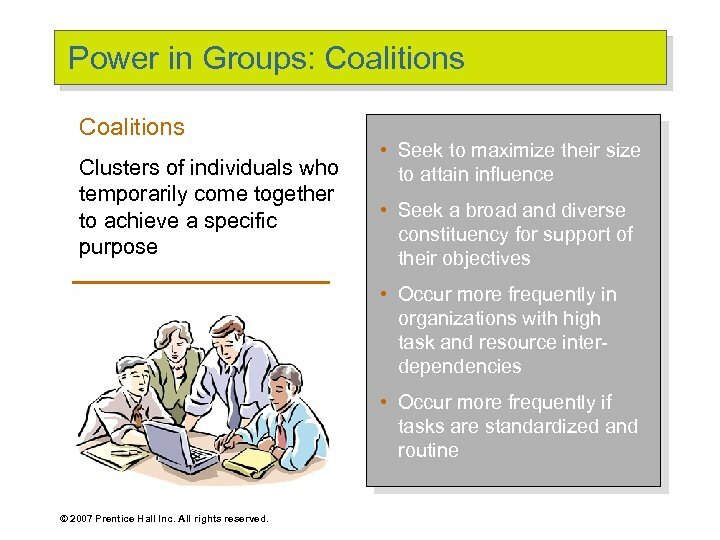 Power in Groups: Coalitions Clusters of individuals who temporarily come together to achieve a specific purpose • Seek to maximize their size to attain influence • Seek a broad and diverse constituency for support of their objectives • Occur more frequently in organizations with high task and resource interdependencies • Occur more frequently if tasks are standardized and routine © 2007 Prentice Hall Inc. All rights reserved. 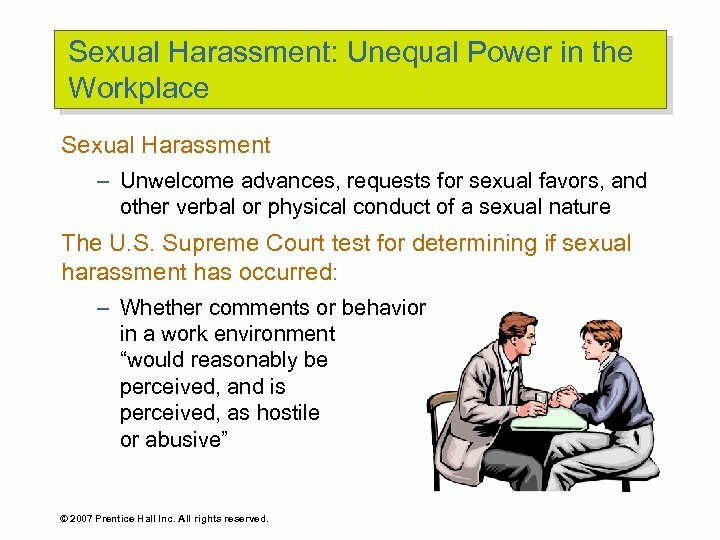 Sexual Harassment: Unequal Power in the Workplace Sexual Harassment – Unwelcome advances, requests for sexual favors, and other verbal or physical conduct of a sexual nature The U. S. Supreme Court test for determining if sexual harassment has occurred: – Whether comments or behavior in a work environment “would reasonably be perceived, and is perceived, as hostile or abusive” © 2007 Prentice Hall Inc. All rights reserved. Steps for Managers to Take to Prevent Sexual Harassment Ø Make sure a policy against it is in place. Ø Ensure that employees will not encounter retaliation if they file a complaint. Ø Investigate every complaint and include the human resource and legal departments. Ø Make sure offenders are disciplined or terminated. Ø Set up in-house seminars and training. © 2007 Prentice Hall Inc. All rights reserved. 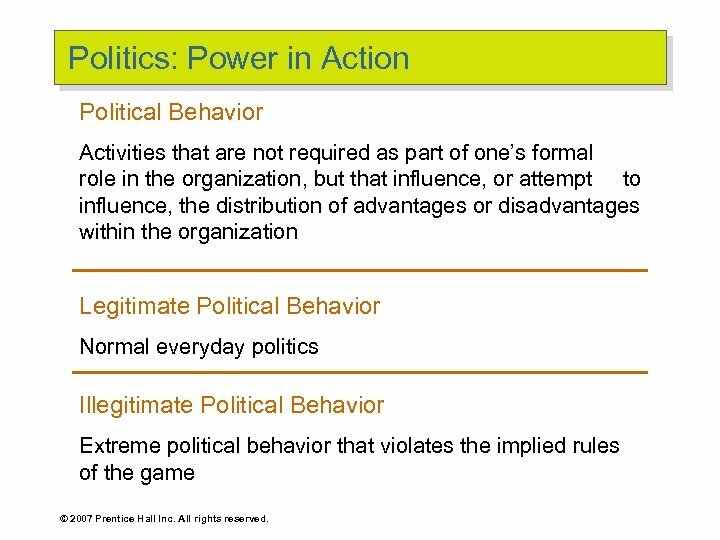 Politics: Power in Action Political Behavior Activities that are not required as part of one’s formal role in the organization, but that influence, or attempt to influence, the distribution of advantages or disadvantages within the organization Legitimate Political Behavior Normal everyday politics Illegitimate Political Behavior Extreme political behavior that violates the implied rules of the game © 2007 Prentice Hall Inc. All rights reserved. 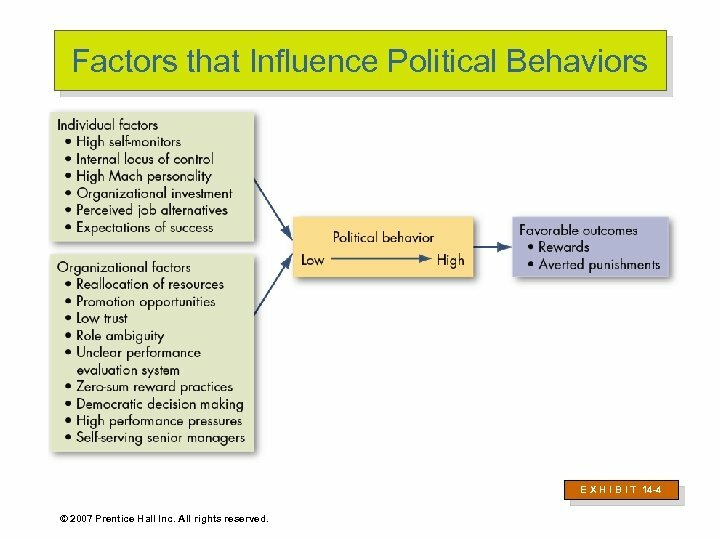 Factors that Influence Political Behaviors E X H I B I T 14 -4 © 2007 Prentice Hall Inc. All rights reserved. 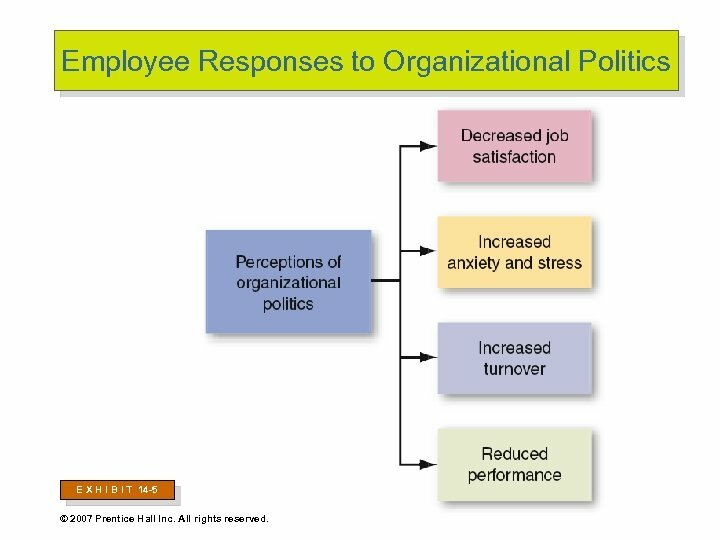 Employee Responses to Organizational Politics E X H I B I T 14 -5 © 2007 Prentice Hall Inc. All rights reserved. 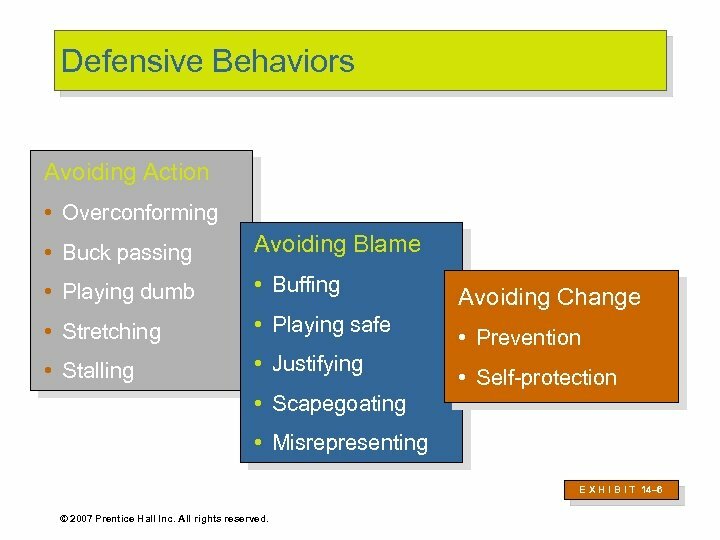 Defensive Behaviors Avoiding Action • Overconforming • Buck passing Avoiding Blame • Playing dumb • Buffing • Stretching • Playing safe • Stalling • Justifying Avoiding Change • Prevention • Self-protection • Scapegoating • Misrepresenting E X H I B I T 14– 6 © 2007 Prentice Hall Inc. All rights reserved. 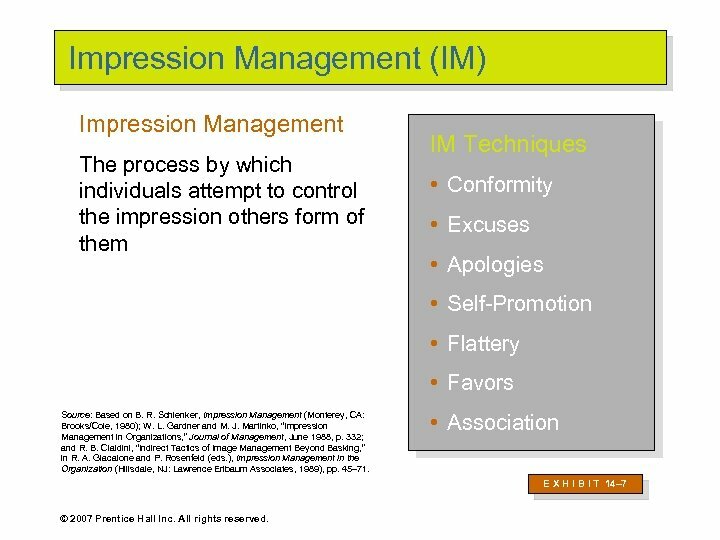 Impression Management (IM) Impression Management The process by which individuals attempt to control the impression others form of them IM Techniques • Conformity • Excuses • Apologies • Self-Promotion • Flattery • Favors Source: Based on B. R. Schlenker, Impression Management (Monterey, CA: Brooks/Cole, 1980); W. L. Gardner and M. J. Martinko, “Impression Management in Organizations, ” Journal of Management, June 1988, p. 332; and R. B. Cialdini, “Indirect Tactics of Image Management Beyond Basking, ” in R. A. Giacalone and P. Rosenfeld (eds. 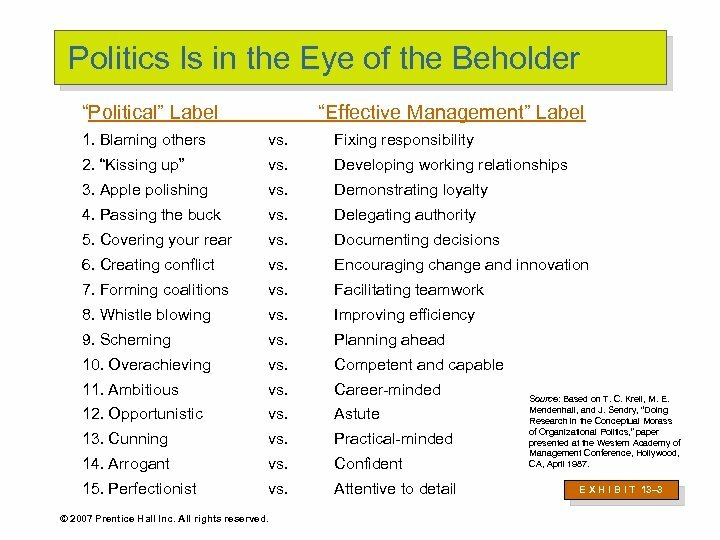 ), Impression Management in the Organization (Hillsdale, NJ: Lawrence Erlbaum Associates, 1989), pp. 45– 71. • Association E X H I B I T 14– 7 © 2007 Prentice Hall Inc. All rights reserved. 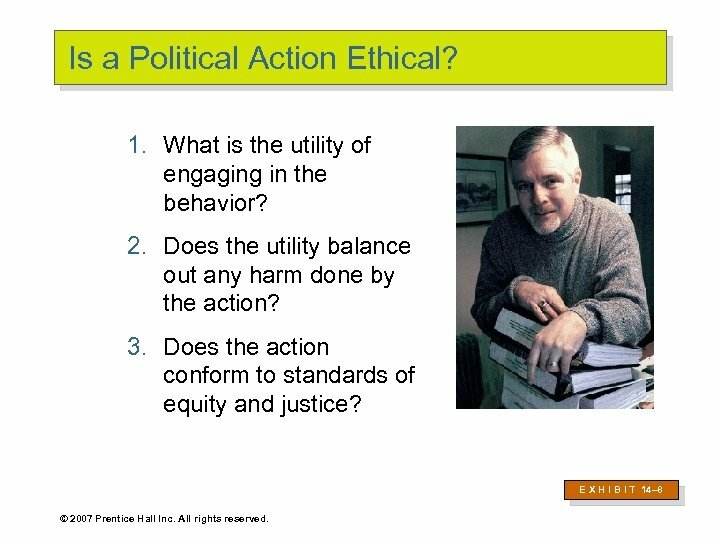 Is a Political Action Ethical? 1. What is the utility of engaging in the behavior? 2. Does the utility balance out any harm done by the action? 3. 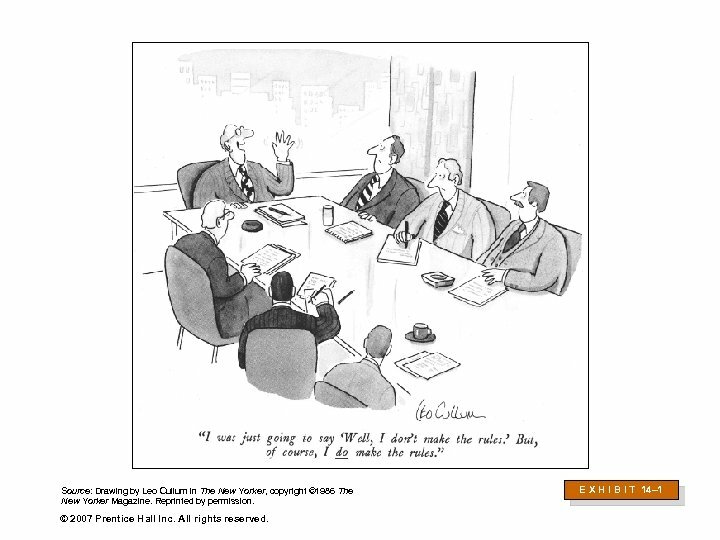 Does the action conform to standards of equity and justice? E X H I B I T 14– 8 © 2007 Prentice Hall Inc. All rights reserved. 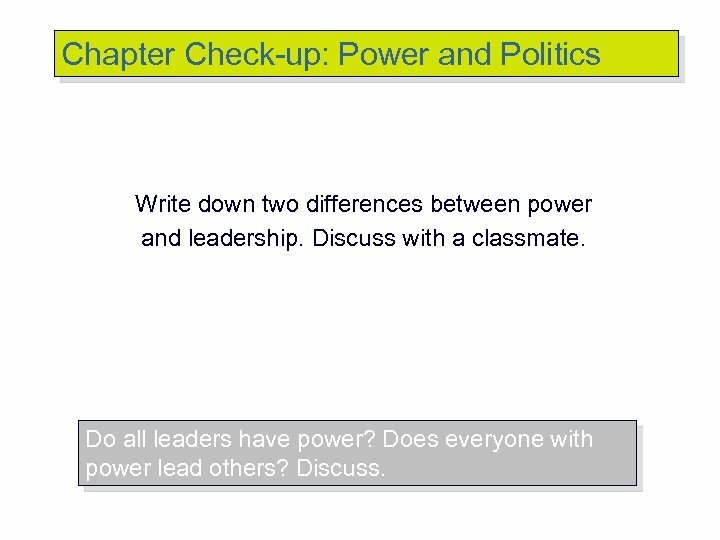 Chapter Check-up: Power and Politics Write down two differences between power and leadership. Discuss with a classmate. 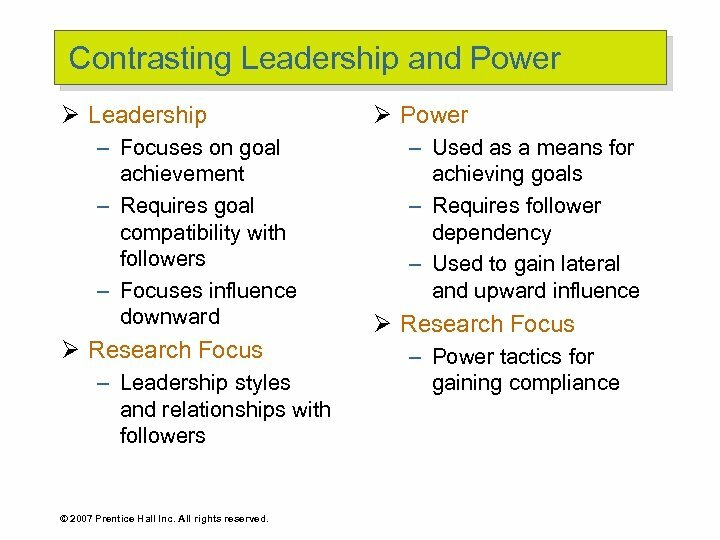 Do all leaders have power? 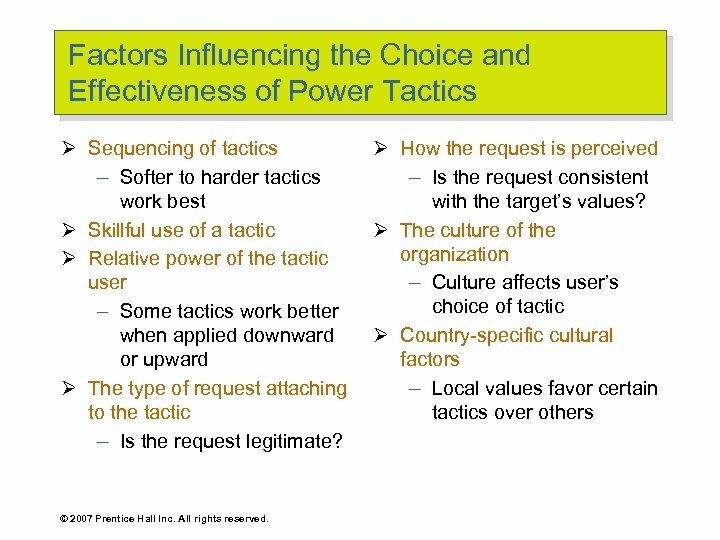 Does everyone with power lead others? Discuss. 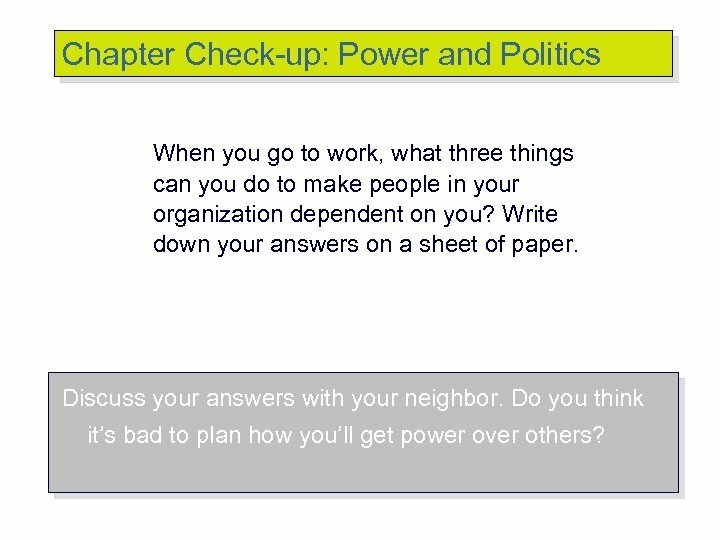 Chapter Check-up: Power and Politics When you go to work, what three things can you do to make people in your organization dependent on you? Write down your answers on a sheet of paper. Discuss your answers with your neighbor. Do you think it’s bad to plan how you’ll get power over others? 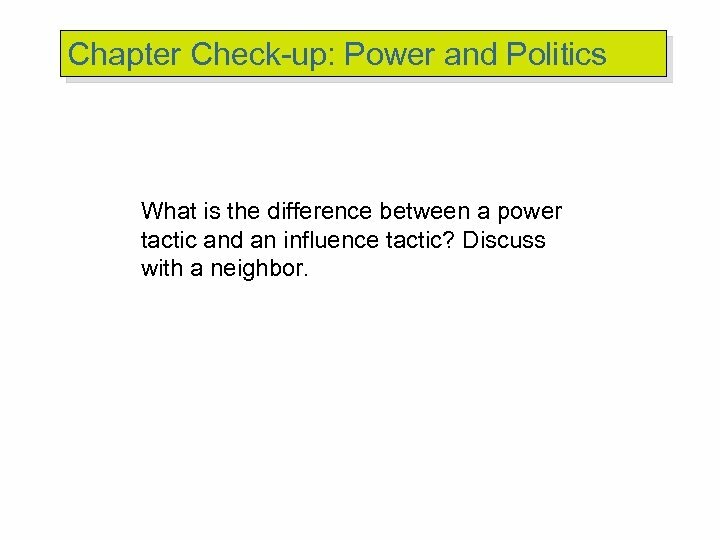 Chapter Check-up: Power and Politics What is the difference between a power tactic and an influence tactic? Discuss with a neighbor.